I'm currently trying to draw trees using the rrgtrees package in latex. 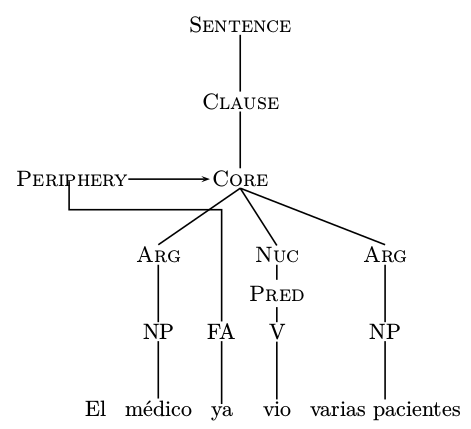 This package is used to draw syntactical trees for Role and Reference Grammar. However, as you can see the PERIPHERY node is blocking the CORE node. That's why I want to try and use \LPERIPH or \RPERIPH because it allows you to set a distance that the PERIPHERY node should be away from the CORE node that it refers to. If someone could please help me with this error or knows a better way to draw the tree that I'm looking for, I would really appreciate it. Thank you. Not the answer you're looking for? Browse other questions tagged pstricks linguistics spanish pst-node pst-tree or ask your own question. 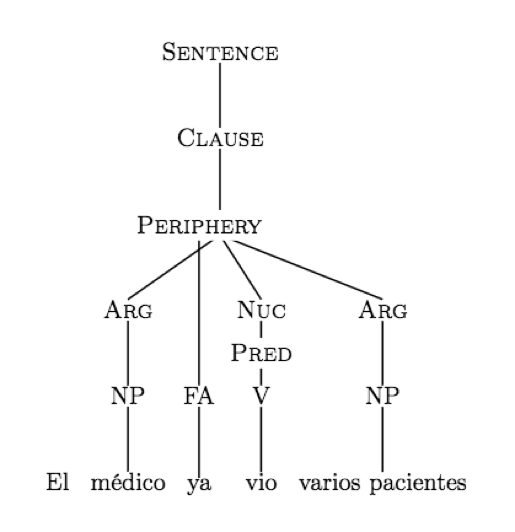 How to create syntactic trees and align them in LaTeX? How to get a tight output when using pst-tree package and standalone class? How to combine bottom-aligned and up-aligned trees?